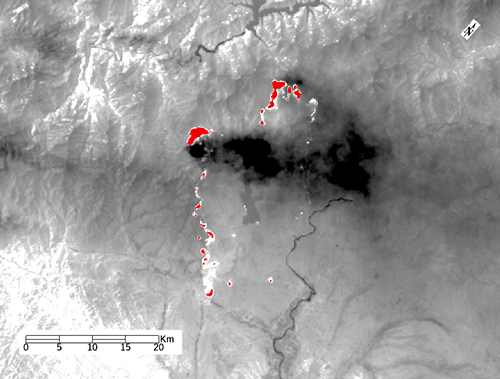 ECOSTRESS has captured new imagery of three wildfires burning in California and Nevada. 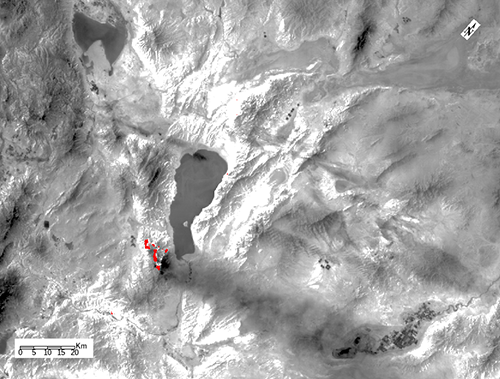 NASA’s Ecosystem Spaceborne Thermal Radiometer Experiment on Space Station (ECOSTRESS) has captured new imagery of three wildfires burning in California and Nevada -- the first image of its kind to be taken by the agency’s newest Earth-observing mission. 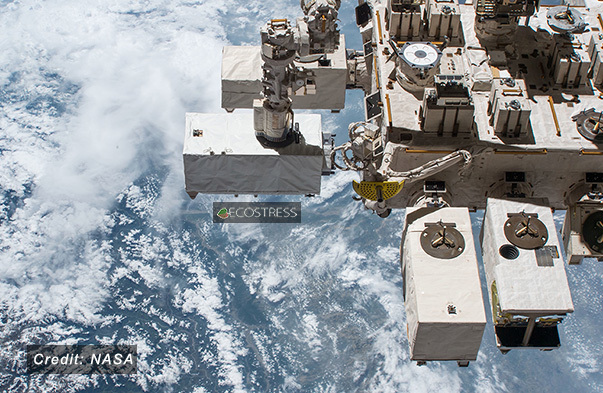 ECOSTRESS’ primary mission is to detect plant health by monitoring Earth’s surface temperature from the vantage point of the International Space Station. 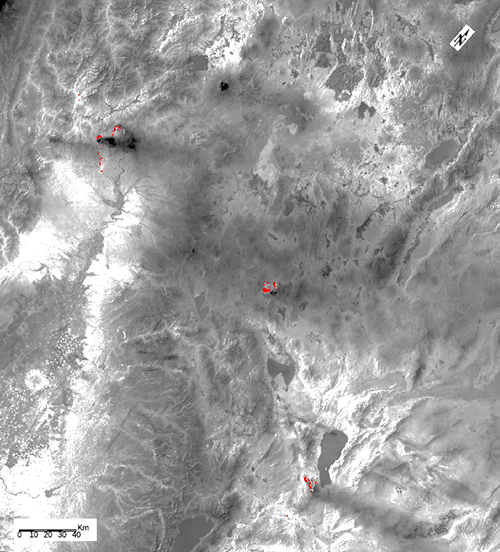 However, it can also detect other heat-related phenomenon -- like heat waves, volcanoes and fires. Just days after its successful installation on the International Space Station, NASA's newest Earth-observing mission, the ECOsystem Spaceborne Thermal Radiometer Experiment on Space Station (ECOSTRESS), has collected its first science data on Earth’s surface temperature. Updated at 11 a.m. PDT on July 6, 2018. Three days after its launch from Cape Canaveral Air Force Station in Florida, the SpaceX Dragon cargo spacecraft -- with NASA’s ECOSTRESS in tow -- was installed on the Earth-facing side of the International Space Station’s Harmony module at 6:52 a.m. PDT (9:52 a.m. EDT) on Monday, July 2. An Earth science instrument built by NASA’s Jet Propulsion Laboratory in Pasadena, California, and experiments investigating cellular biology and artificial intelligence, are among the research heading to the International Space Station following Friday’s launch of a NASA-contracted SpaceX Dragon spacecraft at 5:42 a.m. EDT. 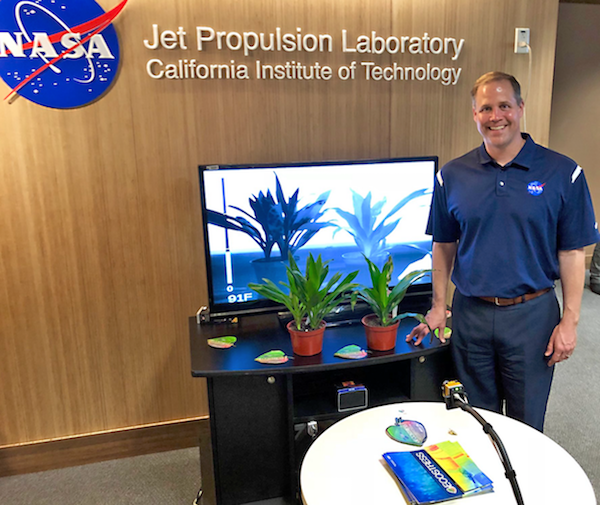 NASA's Ecosystem Spaceborne Thermal Radiometer Experiment on Space Station (ECOSTRESS) is designed to study how plants respond to heat and water stress by measuring the temperature of Earth's vegetation at all times of day with an accuracy of a few tenths of a degree. This amendment to the ROSES-18 solicitation provides a new proposal due date for program element A.7 ECOSTRESS Science Team. and ECOSTRESS! A new batch of science is headed to the International Space Station aboard the SpaceX Dragon on the company’s 15th mission for commercial resupply services. The spacecraft will deliver science that studies the use of artificial intelligence, plant water use all over the planet, gut health in space, more efficient drug development and the formation of inorganic structures without the influence of Earth’s gravity. Find out more about the 5 investigations headed to the ISS! To see this feature, please click here to access the report and go to "Learn More." Newswise — Farmers irrigating their crops may soon be getting some help from space. 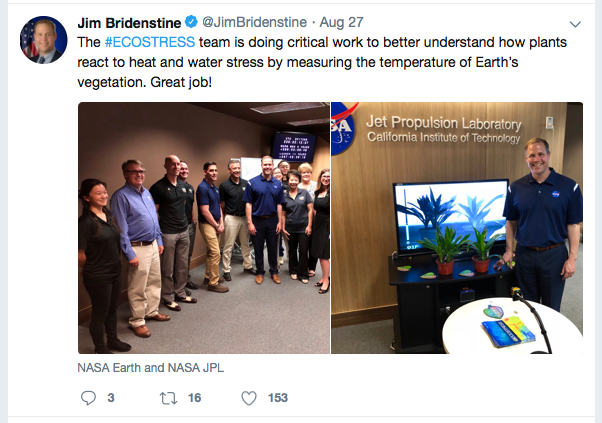 In 2018, scientists launched ECOSTRESS, a new instrument now attached to the International Space Station. Its mission: to gather data on how plants use water across the world. 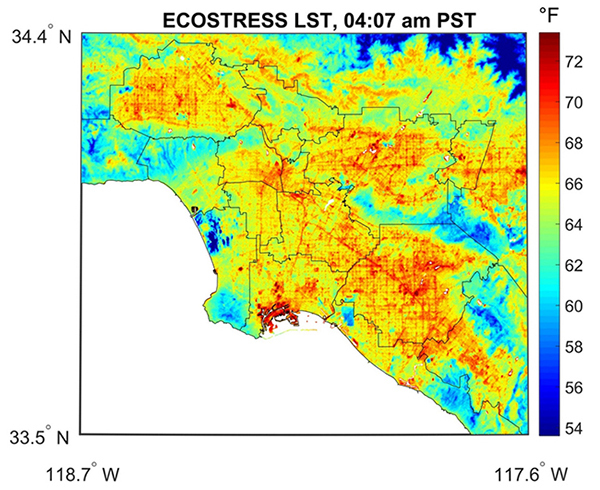 ECOSTRESS L1B products are now publicly available! World Agriculture Expo 2019 | Link to Tweet | Link to Video ECOSTRESS highlighted at about minute 28! Expedition 55 Flight Engineers Drew Feustel and Ricky Arnold will don spacesuits and exit the station’s Quest airlock about 8:10 a.m. March 29 to begin the 209th spacewalk in support of space station assembly, maintenance and upgrades. This program element will seek proposals for membership on the ECOSTRESS Science Team. The focus of these proposals will likely be utilization of ECOSTRESS Level 2 (Surface Temperature and Emissivity), Level 3 (Evapotranspiration), and/or Level 4 (Water Use Efficiency and Evaporative Stress Index) data products for basic and applied research of importance to Earth system science. However, the solicitation will likely also be open to the production of alternative data products to those produced by funding to the ECOSTRESS Principal Investigator team. In addition, it will likely support proposals for enhanced calibration/validation activities that may be important for some classes of mission products. In 2018 technologies on the International Space Station will provide ∼1 year of synchronous observations of ecosystem composition, structure and function. We discuss these instruments and how they can be used to constrain global models and improve our understanding of the current state of terrestrial ecosystems. Instruments discussed include ECOSTRESS, OCO-3, GEDI, HISUI. The fate of the terrestrial biosphere is highly uncertain given recent and projected changes in climate. 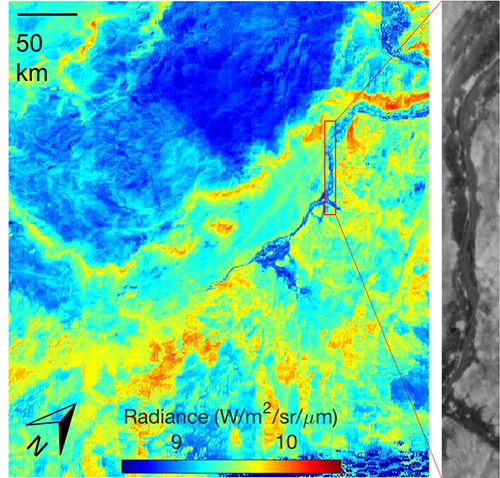 This is especially acute for impacts associated with changes in drought frequency and intensity on the distribution and timing of water availability. The development of effective adaptation strategies for these emerging threats to food and water security are compromised by limitations in our understanding of how natural and managed ecosystems are responding to changing hydrological and climatological regimes. This information gap is exacerbated by insufficient monitoring capabilities from local to global scales. Here, we describe how evapotranspiration (ET) represents the key variable in linking ecosystem functioning, carbon and climate feedbacks, agricultural management, and water resources, and highlight both the outstanding science and applications questions and the actions, especially from a space-based perspective, necessary to advance them.